As seen in the Triad Business Journal on June 14, 2018. As part of a community-wide effort to revitalize downtown High Point, a global innovation and entrepreneurship center geared toward the furniture industry is expected to be partially open by the October furniture market. An initiative called HP365 operating under the Business High Point-Chamber of Commerce, the center will be housed in the 100,000-square-foot former Adams Millis hosiery mill. And there's much work to be done to have the center open to the public come October, when the High Point Market is in town. Tim Branscome, CEO of consulting firm The Branscome Group and the HP365 initiative, told Triad Business Journal he expects the center to be 40 to 50 percent operational by the fall market, with the center reaching full operational status by the April 2019 market. “HP365 is global in its scope, serving as a platform for new startups, while also supporting the large number of active designers, producers and service companies already located in the High Point region,” he said. "This one-of-a-kind project could not be pulled off in any city other than the furnishings capital of the world." 21,000 square feet of co-working space, which will include rentable working and conference rooms, private offices and workspace/social areas with affordable and high-end options. A 1,500-square-foot furniture materials library sourced through New York City-based Material Connexion. A 3,000-square-foot 3-D printing facility. A 2,200-square-foot ground level flex space for a showroom and networking. A 4,000-square-foot restaurant on the top floor overlooking the future High Point baseball stadium. A café with 2,000 square feet of interior space and more than 1,000 square feet of patio space. Retail space on the lower-level of an undetermined size. Ten to 12 guest rooms taking up about 4,000 square feet. Branscome said the building at 410 W. English Road – formerly known as Union Square and most recently occupied by exhibitors during the biannual furniture markets – was purchased in March for $4.5 million by David Congdon, a member of Business High Point-Chamber of Commerce and executive chairman of Old Dominion Freight Line. The transformation of the former mill to an innovation and entrepreneurship center is being funded by a $1.5 million grant from the N.C. Department of Commerce and matching funds of $1.5 million from private donors. Branscome said he expects phase one of the co-working space – about 7,500 square feet – to be complete for the October market, along with the materials library, café, flex space and the event space. 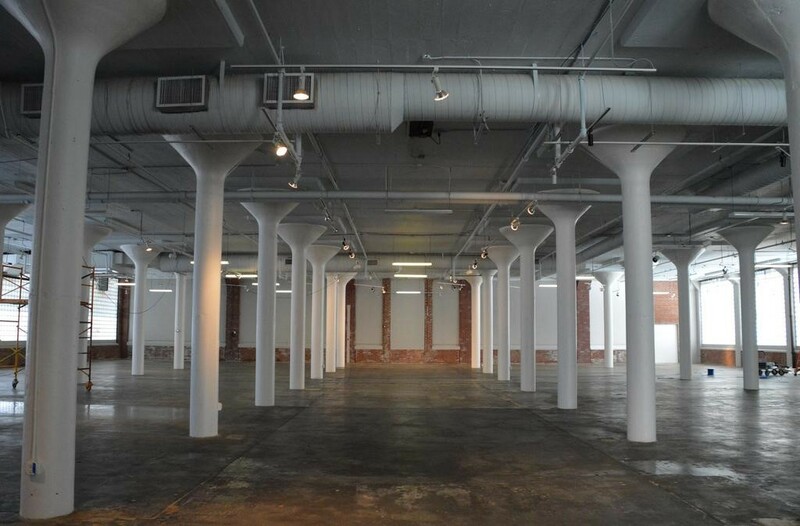 The event space will take up a whole floor and will accommodate workshops, seminars and private business events. Tenants for the cafe space and restaurant space have not been picked, Branscome said. Leaders are negotiating with two business for the café and three companies for the restaurant. The potential tenants are either Triad or North Carolina businesses, Branscome said, and potential tenants for the restaurant are all farm-to-table businesses. And the Business High Point initiative is in negotiations with contractors for most aspects of the building transformation, Branscome said, including plumbing, interior design and architecture, roofing, windows and HVAC installation. About $1.5 million has been allocated for building renovations and updates, but the building was already in great shape since it was used as exhibition space, Branscome said. The remaining $1.5 million in funding will be used for building operations. But the initiative is working to receive a WELL Certificate from the International WELL Building Institute, which entails updating the building to improve water, air, light and overall comfort of a building for better energy and health efficiency. Branscome said he is in talks with a local architect regarding building upgrades to receive the certificate, "which is making it a little more complex." They have not finalized details of the future retail space, which will be located on the ground floor with the café and flex space, he said, since they do not know how much ground floor space will be occupied by furniture exhibits by local makers. Branscome said the retail space will be occupied by the April furniture market.